Yesterday, the U.S. Consumer Product Safety Commission announced the recall of Easton's EA30 threadless stems. The company has received at least one report of the stem cracking and failing causing a rider to lose control of his bike, according to the Commission. The stems are described as "black with white-and-gray graphics and feature a four-bolt stem face cap. 'EA30' is printed on the stem." 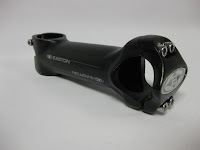 If your bicycle has this stem contact Easton Sports for a free replacement.